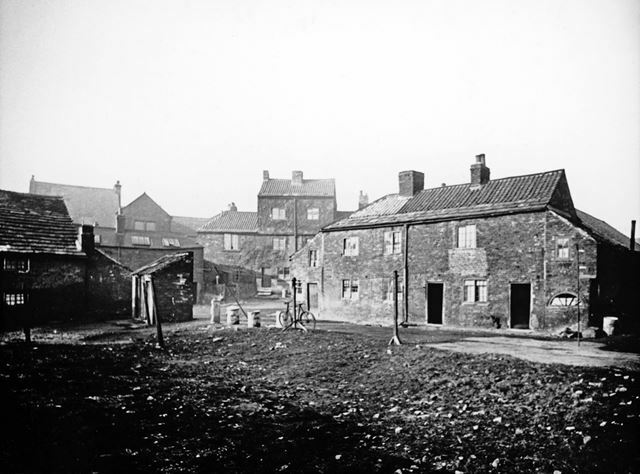 The building in the foreground was first known as a Malthouse built by John Smith's wife, c1814 (J Smith of the Griffin Foundry, Brampton). In 1852 William Bradbury Robinson bought Field House (later known as Bradbury Hall) and Brewery Yard. The 1875 map shows the building as a Soda Manufactory. About 1887, St Thomas' Mission Church began in the Malthouse and later the Salvation Army moved in. In 1934 Robinsons altered the exterior and it was called 'Everybodies Hall'. The building was demolished in 1973 and the site is now part of a car park for Bradbury Hall.